‘Vision, or imagination,’ writes Blake, ‘is a representation of what actually exists, really and unchangeably. Fable, or allegory, is formed by the daughters of Memory.’ A vision is, that is to say, a perception of the eternal symbols, about which the world is formed, while allegory is a memory of some natural event into which we read a spiritual meaning. In vision the meaning chooses its own symbol by a kind of affinity, while in the case of allegory we choose out some corporeal accident, and build into our memory of it a little vision, for allegory, according to Blake, contains ‘some vision’ always, and lift it up into a personification of a spiritual or natural meaning. The relationship of William Butler Yeats with William Blake has been well covered in criticism, and almost every study of Yeats will contain some reference to the older poet. If anything the tendency has probably been to overstate Yeats’s debt to Blake, partly because literary critics are most comfortable with literary influences. With respect to A Vision specifically, the most notable contributions are those of Kathleen Raine, Hazard Adams, and Harold Bloom. Raine’s essays ‘Yeats’s Debt to Blake’ (1966), ‘From Blake to A Vision’ (1979), ‘Death-in-Life and Life-in-Death’ (1974) and ‘Blake, Yeats and Pythagoras’ (1982) are collected in Yeats the Initiate (1986), and Blake figures throughout her later collection of papers W. B. Yeats and the Learning of the Imagination (1999), particularly ‘Yeats and the Afterlife’ and ‘Poetry as Prophecy’. Raine’s emphasis has been on the continuity of the ‘Perennial Philosophy’, especially as exemplified in these two poets, and has consistently argued that Yeats needs to be read through an understanding of his philosophical background and standpoint, in defiance of academic trend or cultural fashion. Despite some misunderstandings, for her, Yeats remains the best interpreter of Blake’s diagrams, because ‘Yeats’s natural aptitude for this diagrammatic type of thought qualified him to understand Blake better than any commentator since. . . . for Yeats and Blake were working within the same tradition’ (Yeats the Initiate, 110). In the same way, her fundamental sympathy with this tradition enables her to write with perceptive understanding of the hermetic frame of mind. She adduces important parallels and sources in Platonism, neo-Platonism, Hermetism and Rosicrucian thought, though the essays can therefore sometimes be fascinating collocations of suggestive ideas and similarities, which avoid analysis or conclusions. Adams’s work from Blake and Yeats: The Contrary Vision (1955) to The Book of Yeats’s Vision: Romantic Modernism and Antithetical Tradition (1995) has sought to divest Yeats of the mystical and magical, and he considers that the ‘occult in [A Vision] is subordinate to the book’s literary purposes, one of which is to dramatize the fate of the poetic way of thinking as Yeats saw it in his age’ (The Book of Yeats’s Vision, 4). He takes Blake’s differentiation of ‘negation’ and ‘contrary’ as central to his reading of Yeats’s System and the nature of ‘antitheticality’, which goes beyond Yeats’s own meaning. According to Adams’s interpretation, in negation one side seeks to suppress the opposite, whereas a ‘contrary is a third term that opposes the two-term negation’ and ‘attempts to bring in the force that will make it possible to dispense with cyclicity’ (12-13), which is the essence of the inclusive‘antithetical’. Bloom, in Yeats (1970), also views A Vision as primarily literary: ‘Blake, Shelley, Morris, Pater, Balzac and Nietzsche count for more in A Vision, and in Yeats’s poetry, than do Blavatsky, Mathers, Swedenborg, Thomas Taylor, Agrippa, and the secrets of the Golden Dawn’ (212), and he views A Vision as part of Yeats’s agonistic reinterpretation of Blake (with nods to Shelley and Freud). He maintains that ‘the substance of A Vision is quarried largely out of Blake (or one should say Yeats’s Blake) with a number of structural hints added from Shelley’ (212) and that ‘Yeats’s earliest prose draft of A Vision, in peculiar but valid sense, is Volume One, "The System," of The Works of William Blake’ (216). Bloom specifically sets out to ‘measure Yeats’s book against Blake’s epics, its most direct ancestors, and Shelley’s Prometheus Unbound, another forerunner’ (212), and finds it wanting. His Blake is not the Blake of diagrams, which he dislikes, but the Blake of luminous vision, so that, for instance, the Four Faculties are thin abstractions next to the vitality of Blake’s Four Zoas, while the antinomies are ‘negations masquerading as contraries’ (261). Despite much that is admirable and thought-provoking, Bloom’s reading is too slanted to give a clear view of the work, mainly because Yeats does not offer the Romantic vision of humanity which he seeks. A significant part of the criticism rests on Yeats’s having failed to understand Blake as Bloom has. However, Bloom does view A Vision in spiritual terms, even if he considers that Yeats’s ‘conception of sainthood is as poverty-striken as his views of God or the soul’ (259), and concludes, ‘That so great and unique a poet abdicated the idea of man to a conception of destiny, however Homeric, is not less than tragic’ (471). To some extent Bloom is right that Yeats’s exposition of Blake’s system prefigures much of A Vision, though probably more because it represents the meeting of the esoteric and the poetic, reflecting the cast of Yeats’s mind, than because Blake’s writing is the source of A Vision. Yeats himself wrote in 1921, some three years after the advent of the System: ‘I am persuaded that our intellects at twenty contain all the truths that we shall ever find, but as yet we do not know truths that belong to us from opinions caught up in casual irritation or momentary fantasy. As life goes on we discover that certain thoughts sustain us in defeat, or give us victory, whether over ourselves or others, and it is these thoughts, tested by passion, that we call convictions’ (Au 189). Though truths are not the same as information, Yeats implies that these central thoughts of his mind predate the work on Blake, which he started at twenty-four, as much as that on A Vision, which he started at fifty-two. I had never read Hegel, but my mind had been full of Blake from boyhood up and I saw the world as a conflict—Spectre and Emanation—and could distinguish between a contrary and a negation. ‘Contraries are positive’ wrote Blake, ‘a negation is not a contrary’, ‘How great the gulph between simplicity and insipidity’, and again, ‘There is a place at the bottom of the graves where contrareities are equally true’. Whether it came from Blake or from his own natural disposition, he was also attracted towards the idea of inversion or transvaluation of conventional categories, either in the motto he chose in the Golden Dawn, ‘Demon est Deus Inversus’, or in a Blakean marriage of heaven and hell. The antinomy of the tinctures is a formalised version of a long-standing cast of mind, which may well also lie behind his interest in Blake in the first instance. If his mind had been full of Blake from boyhood, he spent years studying the poet in his youth, and in 1889, Yeats and Edwin J. Ellis ‘began . . . four years’ work upon the "Prophetic Books" of William Blake’ (Au 161), leading to the publication of the three-volume Works of William Blake Poetic, Symbolic, and Critical in 1893. It evidently pleased Yeats that the work gave his esoteric studies a respectable outlet, enabling him to justify his studies to sceptics such as his father and John O’Leary. 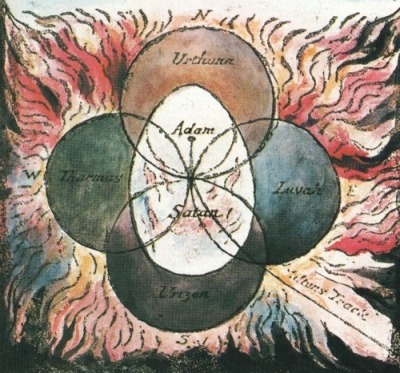 Blake’s philosopy required ‘an exact knowledge for its pursuit’, helping Yeats to trace ‘the connection between his system and that of Swedenborg or of Boehme’. He had also ‘recognized certain attributions, from what is sometimes called the Christian Cabbala, of which Ellis had never heard’ (Au 161), so although Ellis was almost twenty years his senior (b. 1848), having been a friend of his father’s for many years, and was more thoroughly acquainted with Blake’s poetry, Yeats brought his occult expertise to the partnership, enabling some explication of the ‘mysticism’. He could therefore write to his nationalist mentor, John O’Leary: ‘You complain of my mysticism. It has enabled me to make out Blake’s prophetic books at any rate. My book on him will I beleive clear up that riddle for ever. No one will call him mad again’ (7 May 1889; CL 1 163). Subsequent scholars of Blake have found Yeats’s interpretations of Blake idiosyncratic and tendentious, and he certainly read Blake to some extent through his personal interests rather than solely by Blake’s own lights, but the creative effect on him and Blake’s example, both positive and negative, were crucial. Yeats’s dramatis personae never becomes as fully mythic as Blake’s. At one stage some of them are almost elemental beings, so that ‘"Michael Robartes" is fire reflected in water, and that Hanrahan is fire blown by the wind, and that Aedh is fire burning by itself’ (VP 803; see Robartes and Aherne), or mythic characters such as Cuchulain, but like Theotormon or Oothoon, they are human, albeit heroic, rather than divine Zoas, and Yeats never seems to have been tempted to move fully into the archetypal world which Blake’s prophetic books inhabit. The world of the Sidhe, or faery, however fascinating, does not dominate, and the divine Tuatha de Danaan seldom figure in later works. Even the personages of A Vision’s Phase of the Moon are almost all historical people not mythic types. Blake resources on the web that might be useful. The Complete Poetry and Prose of William Blake, (an electronic edition of David V. Erdman’s book). The William Blake Archive and its links. A useful glossary of Blake’s figures and terms, is available at Joseph Hogan’s site on the Urizen books or Alexander S. Gourlay’s glossary. A critical survey is available in J. P. R. Wallis’s essay on Blake. This last group is perhaps the most interesting in terms of A Vision, since Yeats specifically introduced the Blakean imagery into the Automatic Script, asking his instructor, ‘do you know Blake terms Head, Heart Loins’ (YVP 1 103). It might be surprising that the Instructor did know this arcane piece of terminology, but this could no doubt be explained by the Instructors’ reliance on the Yeatses’ minds (see What was really happening in the Automatic Script?). Yeats introduced these terms at a very early stage of the automatic sessions, when the emphasis was on a fourfold division of a lunar cycle featuring beauty, ugliness, anger and wisdom, and on the same day that the twenty-eight Phases of the Moon were first mentioned, 21 November 1917. The term ‘Stomach and womb’ was replaced by the more abstract ‘Fall’, apparently by Yeats, though he then asked ‘What do you mean by fall’ and was told that it was ‘The beginning of anger and the departure from wisdom’ (YVP 1 103; unfortunately this is one of the places where the editors decide to summarise diagrams rather than show them). The fourth term had been slightly awkward even in the exegesis of Blake, standing outside the schema: ‘Beulah, Alla, and Al-ulro are symbolical of the triad of personal life—head, heart, loins, or of thinking, emotional, and instinctive existence. Or-ulro and Jerusalem are respectively below and above the limited life of the personality. They are God’s external and internal influences upon the world, the creation from darkness, the influx from the light’ (WWB 1 260). Despite this, the following section on ‘The Fall of the Soul’ takes these as ‘the four states of humanity—Beulah, Alla, Al-ulro, and Or-ulro’, corresponding ‘to head, heart, loins, and womb’, constituting ‘a phase of the correspondence of macrocosm and microcosm. When man is in harmony with the Divine scheme they are continuous with each other and differ alone in that the one series is universal and the other particular’ (WWB 1 262). Yeats’s reading of the symbolism was probably influenced by the importance of elemental attributions in the Golden Dawn’s system, and also by the Cabbalistic teaching concerning humanity’s position with respect to the Tree of Life, which is shifted downwards by the Fall. According to Yeats, in Blake’s symbolism the head should be in the light, the heart in the air, loins in the water and the womb in earth, or raised in regenerated man, so that head is in divine fire, heart in light, loins in air and womb in water, but the Fall of man leads to an inversion of the Divine order, so that ‘the heart is full of water, the head is in the earth, and the loins are in the air and light’ (WWB 1 263). In the initial dialogue concerning these categories or points in the Automatic Script (YVP 1 103-04), Yeats considered the terms in relation to the fall or to ‘unspiritual man’, but since the non-Blakean ‘fall’ is included within the tetrad, it seems to be an intrinsic element of the whole. In ensuing sessions the symbolism gradually shifted away from that of Yeats’s Blake, as signifying temptations: ‘at fall an instinctive temptation [Venus][Mars] – at heart an emotional [Venus][Saturn] – at head an intellectual [Mars][Mercury] – at loins a spiritual [Moon][Jupiter] (YVP 1 104). The relevance of Head and Heart is relatively straightforward, but ‘instinctive existence’ has been shifted to ‘Fall’ and the link between Loins and the spiritual is less clear. the second role is astrological, since these points were linked from the very first to the four cardinal signs of the Zodiac (Aries , Cancer , Libra and Carpicorn ), though Yeats revised the positioning between AV A and AV B. They come to be related to the position of the equinoxes (as they will be in ca. 3000 CE), and therefore to the ‘horoscope’ of the Universal Man — thus returning to a form of Blake’s symbolism. A fuller consideration of this relatively minor but complex element within the System, titled Head, Heart, Loins and Fall, is in preparation. ’. Though Yeats would no doubt have considered the comparisons valid, and they do throw up some interesting points, they serve more to underline the differences than the similarities, for instance, showing how the classification of Head, Heart and Loins shifts in Yeats’s usage. The Cherub is divided into twenty-seven heavens or churches, that is to say into twenty-seven passive states through which man travels, and these heavens or churches are typified by twenty-seven great personages from Adam to Luther, by the initiation, progress and close of a religious era; and after Luther, who preached “private judgment,” Adam, its symbol, is said to begin again “in endless circle,” one era closes, another commences. In these twenty-seven great personages, and their lives as set forth in sacred and profane history, Blake found, wrapped up in obscure symbolism, the whole story of man’s life, and of the life of the moods, religions, ideas, and nations. Yeats, possibly in some kind of Bloomian misprision, perfects the number of faces of his own Covering Cherub at twenty-eight, with a rather more haphazard and ahistorical series of great personages to express ‘the whole story of man’s life’. And the historical cyclicity, which Yeats sees as Blake’s great break from Swedenborg’s original linear progression, is set to a slightly different rhythm by Yeats’s successive and endless turnings of the gyre, although, if Blake took contemporary estimates for the epochs of biblical events, the time-scale within recorded history is little different. Each element of the cycle is further like a fractal image, containing versions of infinitely receding reflections: ‘It must be remembered that all these complex symbols contain the others in miniature within them. All is within all, and every one of the twenty-seven churches contains the whole twenty-seven fold in miniature’ (WWB 1 308). Some forty years later Yeats presents a similar formulation: ‘Every phase is itself a wheel’ (AV B 89). One of Yeats’s problems in his chapters for the ‘big book on the philosophy of Blake’ (AV A 134) was to account for the absence of zodiacal symbolism in the prophetic books. This he resolved by showing that Blake had ‘found a substitute for [the signs of the Zodiac] by arranging the twenty-seven heavens upon the sun’s path’ (WWB 1 300). 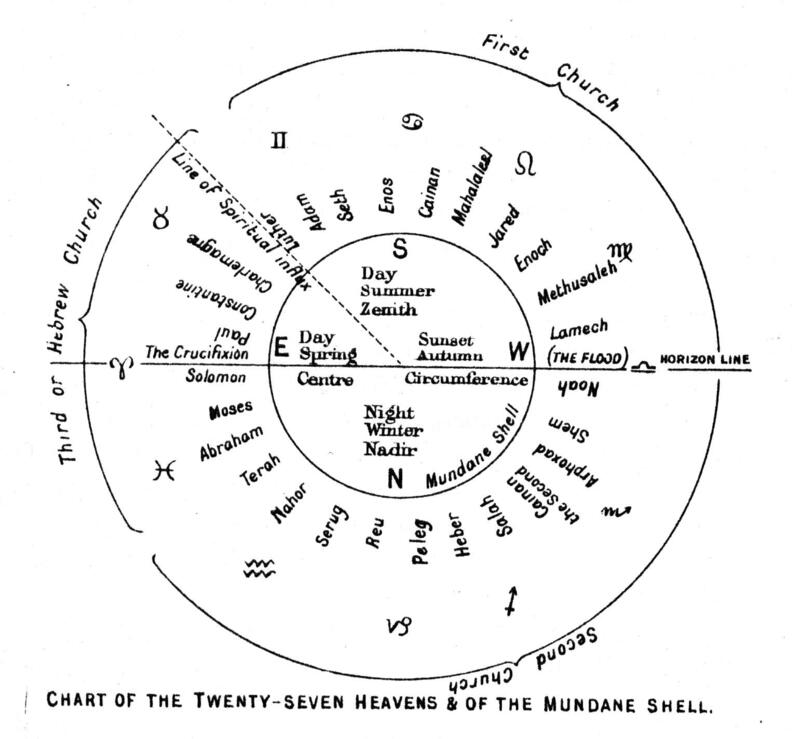 Yeats’s own diagram of this process further illustrates the cycle, showing the Zodiac of the Mundane Shell surrounding the heavens, the Solar twelve-month division corresponding with the churches of ‘moony Beulah’ in complementary concentric rings.